[SatNews] Arianespace is maintaining its rapid-paced mission planning in 2014 as preparations move ahead for the next flight—a light-lift Vega launch, which is to orbit the DZZ-HR Earth observation spacecraft from French Guiana on April 28. DZZ-HR will operate from Sun-synchronous orbit, providing Earth observation data for Kazakhstan in a full range of civil applications. This 900kg.-class satellite is undergoing the fueling process in the Spaceport’s S5 payload preparation center, while Vega has taken shape at the separate SLV launch facility. DZZ-HR was produced by Airbus Defence and Space for the Republic of Kazakhstan’s government, and will be deployed into Sun-synchronous orbit by Vega. Once operational, the satellite is to provide information for a complete range of civil applications – including monitoring of natural and agricultural resources, the provision of mapping data, and support for rescue operations. Vega is one of three launchers operated by Arianespace at the Spaceport, along with the medium-lift Soyuz and heavyweight Ariane 5. Developed in a European Space Agency program led by the Italian ASI space agency and industrial prime contractor ELV SpA., Vega was conceived to orbit small- to medium-sized satellites, including institutional and scientific spacecraft. 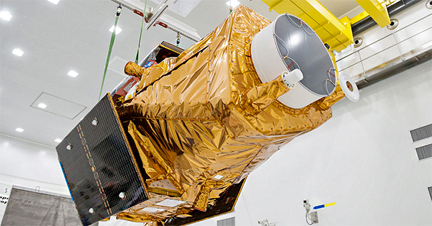 The upcoming Vega mission’s VV03 designation in Arianespace’s launcher family numbering system signifies the third flight of this vehicle, following missions conducted in May 2013 and February 2012. It will be the second launch performed during April by Arianespace, following Flight VS07 with Soyuz – which lofted Europe’s Sentinel-1A Earth observation satellite on April 3. Follow Arianespace's launch activity at http://www.arianespace.com/.